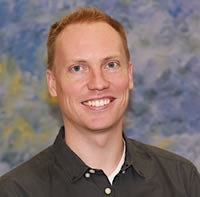 Matthew T. Sheldon received his BA from Carleton College (Chemistry), PhD from UC Berkeley (Chemistry), and performed his postdoc at Caltech (Mat.Sci/App.Phys). He is the recipient of the 2015 Air Force Office of Scientific Research Young Investigator Program (AFOSR YIP) Award, the Kaneka Junior Faculty Award (2017), and was selected as a 2017 Inventor Fellow by the Gordon and Betty Moore Foundation. The central focus of research in the Sheldon Laboratory is to understand how the structural properties of nanoscale semiconductor and metallic materials can impart unique optical and electronic behavior, and to employ these attributes when they are advantageous for applications in solar energy conversion and more general optoelectronic and photoelectrochemical processes. More fundamentally, a unifying theme of our work is the deep insights provided by analyzing the opportunities for nanoscale materials in terms of underlying thermodynamic concepts. In this seminar I will discuss some of our recent breakthroughs in defining nanocrystal optical response, and plasmonic optoelectronic device design that exemplify how these materials enable new avenues for circumventing assumed thermodynamic limitations in optical energy conversion.